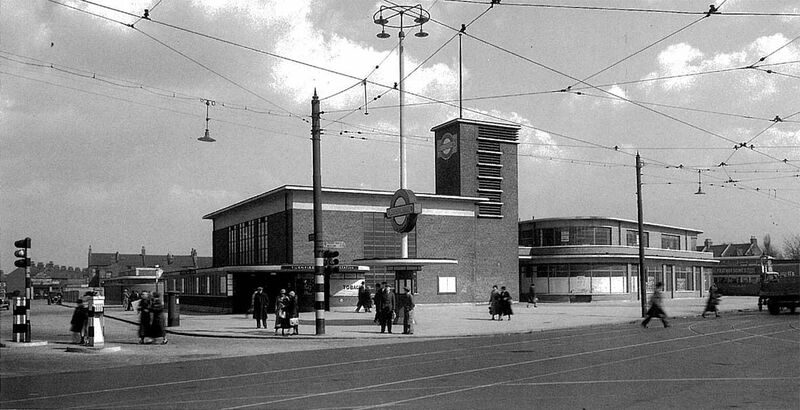 The frontage of Turnpike Lane station on the corner of Westbury Avenue and Green Lanes. Turnpike Lane westbound platform with a train of 73 stock heading for Heathrow 1, 2,3 and 5. Naturally Turnpike Lane has a number of touches not seen at the other stations. The lower hall is on a curve compared to the other stations on the extension. 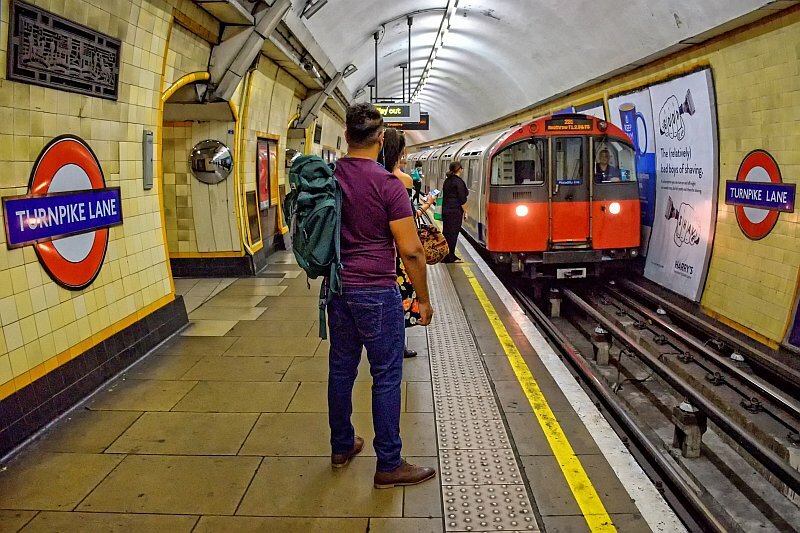 TL’s escalators are a modern version of the traditional LTPB design which is seen at some other tube stations, including Tooting Bec. 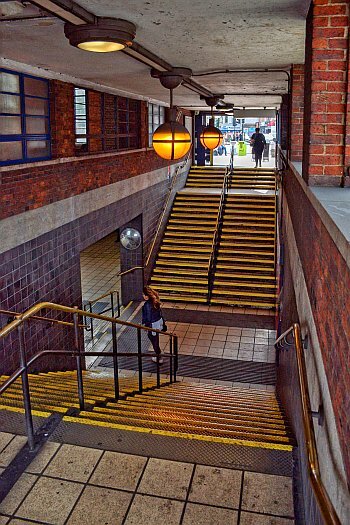 The next station along the Piccadilly’s route, Wood Green, has modern escalators but without uplighters. Another unique touch at this station are the shopping parades. These are quite substantial and front onto Green Lanes, forming a screen behind which the bus station itself stood. The only other station on the line with a shopping parade is Southgate. 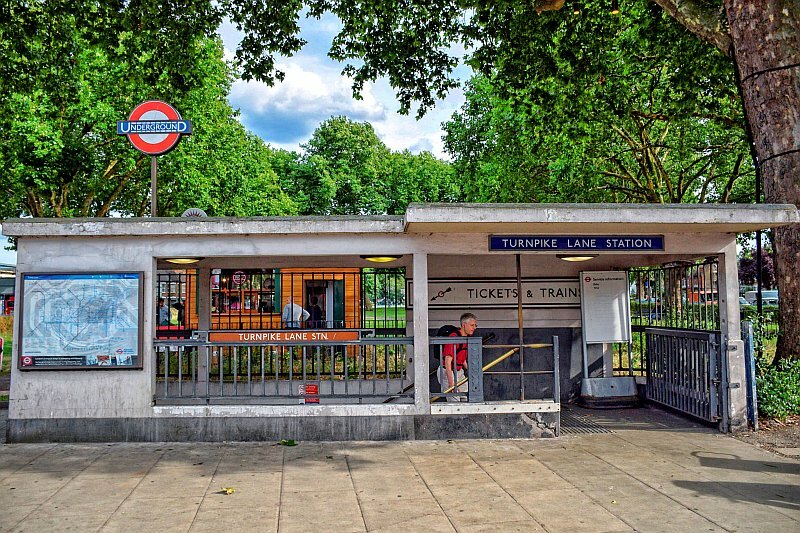 Turnpike Lane’s main building is a classic brick box with a concrete lid, however curves are used for the canopies and the bus station/shopping parades. 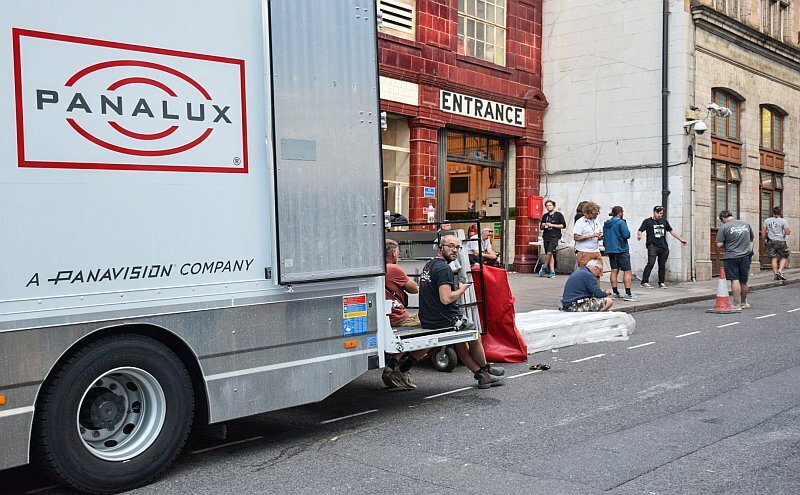 Compare this with Arnos Grove which is the other way round – a huge circular brick building with a box like base. It seems to me Turnpike Lane may have influenced the numerous bus stations commissioned by Frank Pick and designed by Wallis, Gilbert and Partners. The lower hall at Turnpike lane with its classic 1930’s art deco uplighter. Another perspective on the lower hall with the escalators in view. The curved hall is apparent. Three escalators were built at each underground stop on the extension. The one here is modern plus uplighters. The design at the underground stations along here was not totally unique. 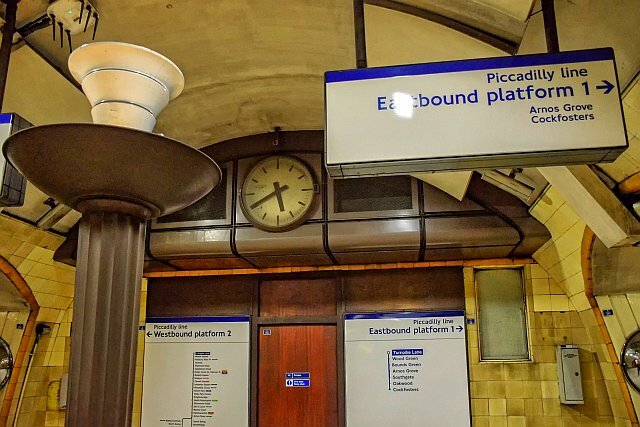 Pictures of the newly rebuilt Holborn station of 1933 show it too used Holden’s designs found on the Cockfosters extension, including the sumptuously tiled decors and curved archways. Holborn is a totally different station today with barely any trace of Holden’s designs. 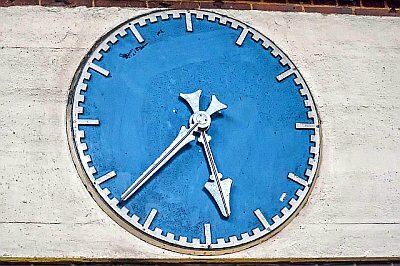 The station hall clock. Wood Green has an identical one. The ticket hall at Turnpike Lane is huge but suffers somewhat from a shortage of daylight. Nevertheless the ceiling is impressive with its cross beams and detailed ceiling. Both this and that at Northfields station are almost alike. However Northfields has windows windows on all four sides compared to Turnpike Lane’s three, making a big a difference in terms of ambiance. The double staircase at Turnpike Lane, a larger version of the one at Cockfosters. These were built to link to their respective bus stations. Without a doubt the biggest two word sign on the entire tube system! The shopping parade is designed to fit in with the rearwards bus station. Classic Holden. It has been said that Charles Holden never designed any of London’s bus stations. That is not true. He integrated bus stations into his designs, so they were essentially part of the shopping parades, hence Turnpike Lane, Southgate and even Cockfosters buck the trend. The bus station at Turnpike Lane was at the rear of the tube station so perhaps was not photographed as much as it should have been. The present bus here station is modern, save for the small shopping and facilities block fronting onto Westbury Avenue which is the original. 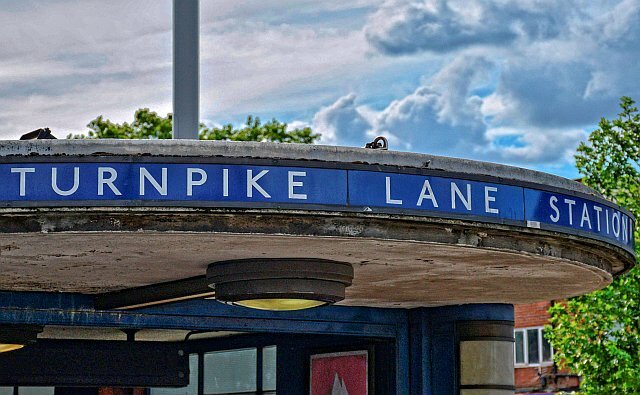 Turnpike Lane currently has four entrances/exits. More were included in the original design and these directly served the local bus and tram services. The passageways and stairs these have now been blocked off. However the remaining entrance by Ducketts Common shares a common design with the former bus/tram islands, a picture which can be seen in this article. The unusual entrance lobby by Ducketts Common opposite the tube station. One of the biggest losses at Turnpike Lane, as evident from the picture above, is its station pylon. Only Southgate and Oakwood retain theirs. It has to be said the one here was possibly a prototype for this has no seats and what appears to be a metal pillar adorned with advertising panels. The others that remain have a concrete pillar surrounded by seating. When the line was being built, one of the names considered for the new station was Ducketts Common! It was dropped because it was said few knew who Duckett was. It wasn’t Sir George Duckett, the wealthy Hertfordshire landowner, who owned the nearby Lee and Stort Navigations, but rather Laurence Duckett, a 13th Century landowner. Turnpike Lane station serves the southern half of Wood Green’s busy High Street, hence its one of a handful of tube stations in London sited at either end of a busy shopping thoroughfare. From Turnpike Lane the Piccadilly Line begins a near three hundred foot climb to the line’s terminus at Cockfosters (308 feet above sea level) save for some slight dips en route. The distance is 8.82km or just under five and half miles at an average of 10 metres per kilometer or 52 feet per mile. Turnpike Lane’s platforms are almost at the bottom of a trough either side of a long continuous climb towards Finsbury Park or Arnos Grove. I will be looking at these gradients in another post.